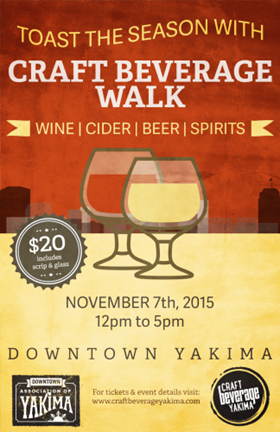 November 7th is the Craft Beverage Walk in Downtown Yakima, WA. This first time event is a collaboration between the Downtown Association of Yakima and Craft Beverage Yakima and features producers of the Yakima craft beverage industry, sampling their product in various downtown business locations. Producers include Tieton Cider Works, Yakima Craft Brewing Company, Hop Nation Brewing Company, Berchman’s Brewing Company, Bale Breaker Brewing Company, AntoLin Cellars, Kana Winery, Wilridge Winery, Naches Heights Vineyard, Gilbert Cellars, JB Neufeld Winery, Glacier Basin Distillery, and Swede Hill Distilling. Participating businesses include 4th Street Theatre, Vintage Me, Leading Force Energy and Design, Fit Studio, Kameo Flower Shop, Yakima Maker Space, and Garden Girl. “We wanted to showcase our city’s rich beverage industry while getting folks into downtown and checking out a business or two that they maybe haven’t been in before,” said Victor De Long, President of D.A.Y. Tickets are $20 each and come with a commemorative sampling glass plus 5 beverage samples. Additional samples will be available on site for purchase. The event goes from noon to 5 PM and begins at 4th Street Theatre.